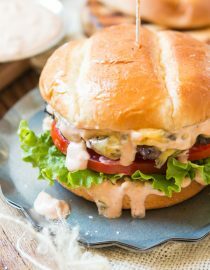 This is it, the killer burger sauce recipe. 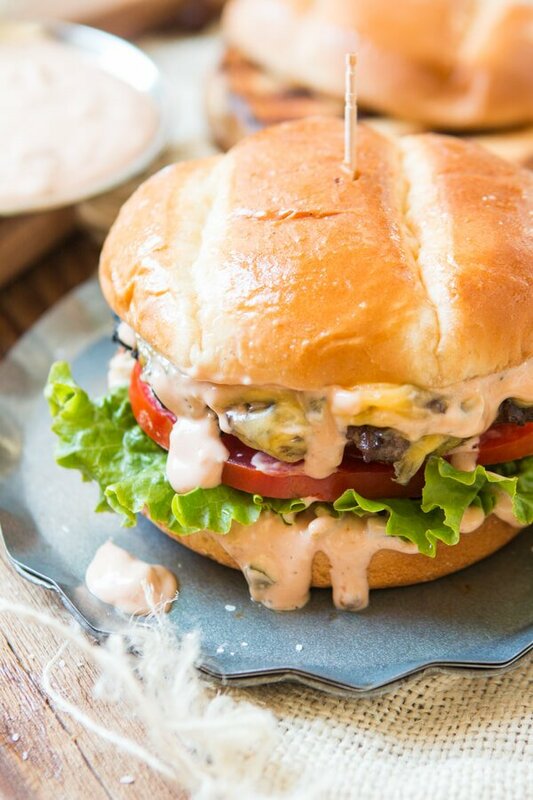 If you don’t want dry, stale burgers look no further for the best classic hamburger sauce. I’ll make this short and sweet since we’ve already talked about our two secrets for the perfect burger. We live by those secrets and sure enough our burger turns out every time. There are just a few other things we thought we would share. First, burgers don’t want to be slow cooked so crank up the heat and quickly cook on each side. We do medium high heat for 2-3 minutes per side. Why do Hamburger Pattys Fall Apart? It’s not about the fat content, honestly. Just make sure you don’t have too many liquidy things in there, like too much Worchestershire sauce or onions, but whats also important is to make sure they are cold when you put them on the grill, AND do not keep flipping them. That will make the burger fall apart for sure. I know we’ve all been taught to send back a pink burger but at a good restaurant or at home you actually should have a slightly pink center. Why? Well eating out you can’t control that’s it’s fresh, good meat being ground and that it’s been carefully prepared and cooked so it’s too risky. But when you use our special meat blend from our 2 secrets post you’ll have a perfect burger if you don’t cook it to well done. I know, it’s a little scary the first time but trust us. An over cooked burger is the same as an overcooked steak. Are Hamburgers Safe to Eat When Pregnant? Although high in fat, hamburgers do contain some nutrients beneficial to you and your baby, including iron and protein. Proper preparation is key to enjoying ground meat without risking bacterial illness, however. 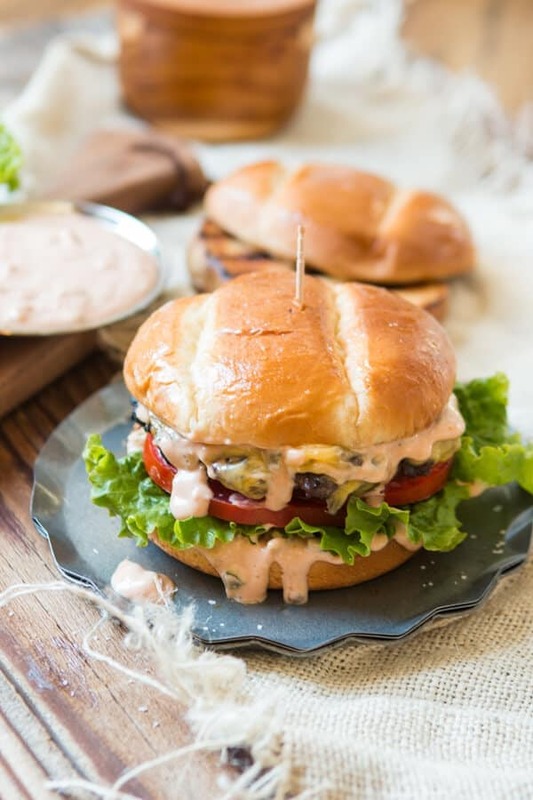 Opt for the leanest possible ground beef to make your hamburger a little healthier. Burger Sauce. 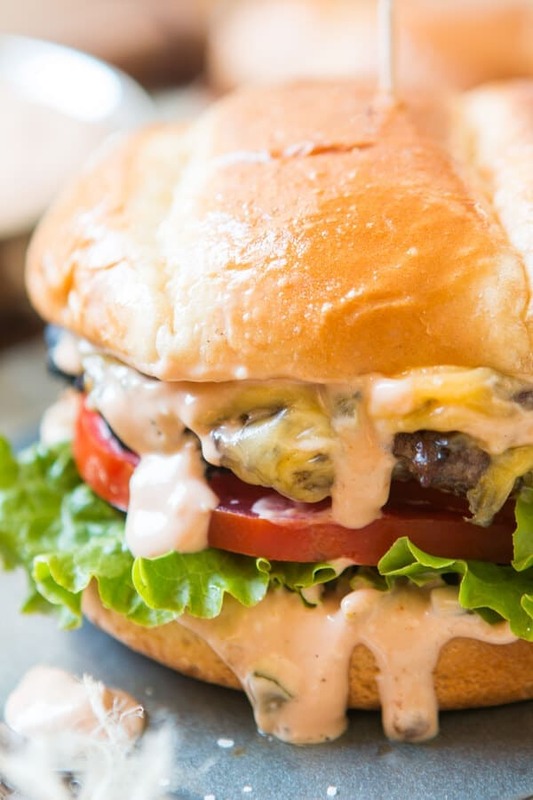 Forget the ketchup and mayonnaise and go for a really good burger sauce. Now, Cade loves pickles on a burger and I generally don’t add them, but in a sauce they add just the right somethin’ somethin’ and you don’t even know that’s what’s in there. 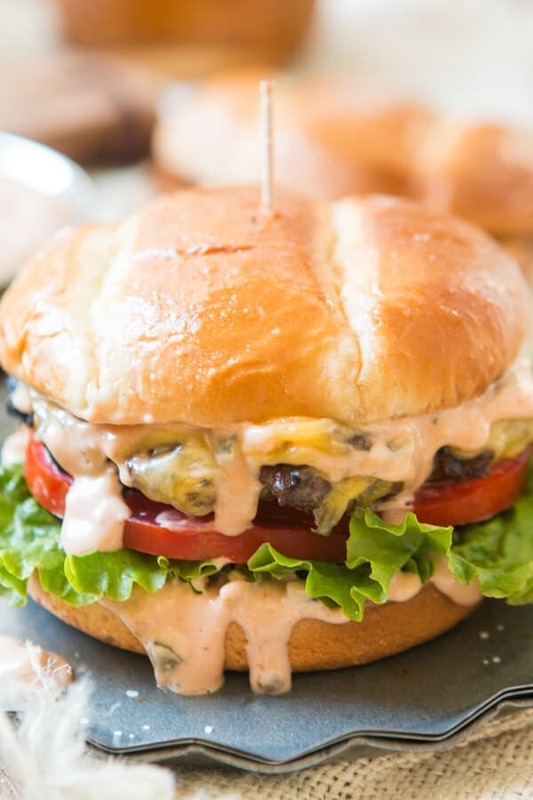 I am a huge fan of sauces and condiments but in the case of the burger, keep it simple, burger, sauce, cheese, lettuce and tomato. A little butter on the burger is always a good thing. Culvers butter burger converted us and we hardly ever make it without butter. AND salt and pepper folks. I cringe a little every time I see a burger get plopped on a grill without seasoning. Do you like your french fries without salt? Well meat needs seasoning as well. Finally, always toast your buns. Always. Whether or not you use butter brushed on the inside and outside is up to you, but always toast those babies. In a small bowl, whisk together the mayonnaise, bbq, ketchup, and mustard. Stir in the relish, Worcestershire, and seasonings. Set aside until you’re ready to assemble. Prepare the tomatoes and lettuce, set aside. Brush the grates with a little oil. Separate the meat into four patties and press out flat, making an indentation right in the center to promote even cooking and less shrinking. Sprinkle with salt and pepper and place a dollop of butter on top. Place each patty on the grill and turn to medium high. Cook on one side for about 2-3 minutes, if the burger is ready to be flipped it will release from the grates, if not allow it to cook a moment more. Flip and season the other side, adding your cheese, shutting the lid and cooking for an additional 2-3 minutes. Meanwhile, brush a little butter on the inside and outside of the buns. Place bottom down on the grill and toast only until grill marks appear. 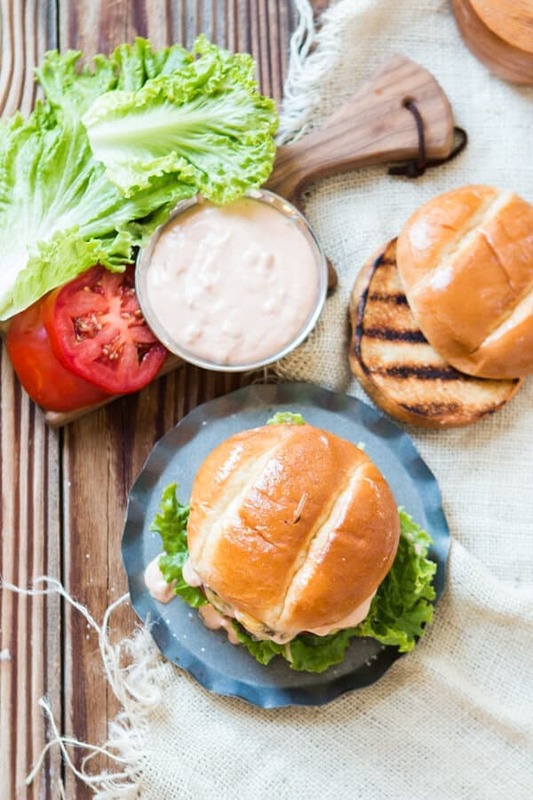 Remove from grill, slather each bun with sauce, lettuce, tomato, and finally the patty, the center should be slightly pink when done. Top with the other half of the bun and enjoy! 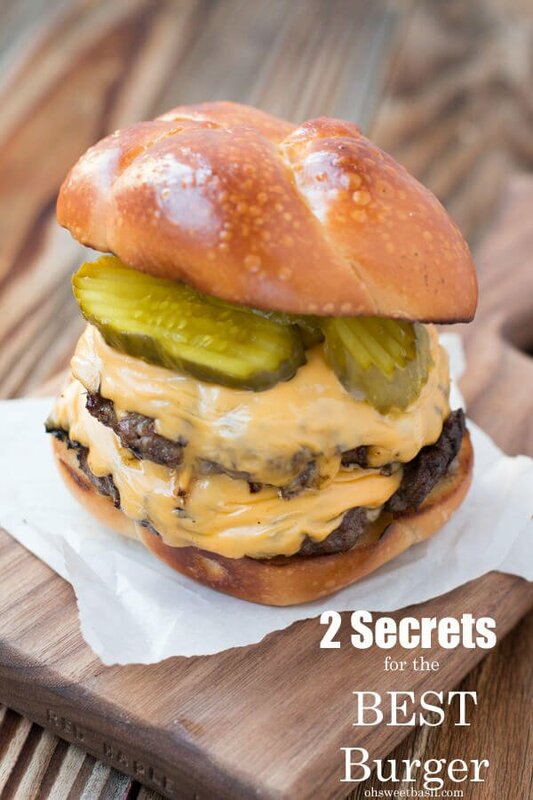 2 secrets for the best hamburger! Are you still buying ground beef in the package and pressing the meat out into a disc? Stop! Let’s try a new way. 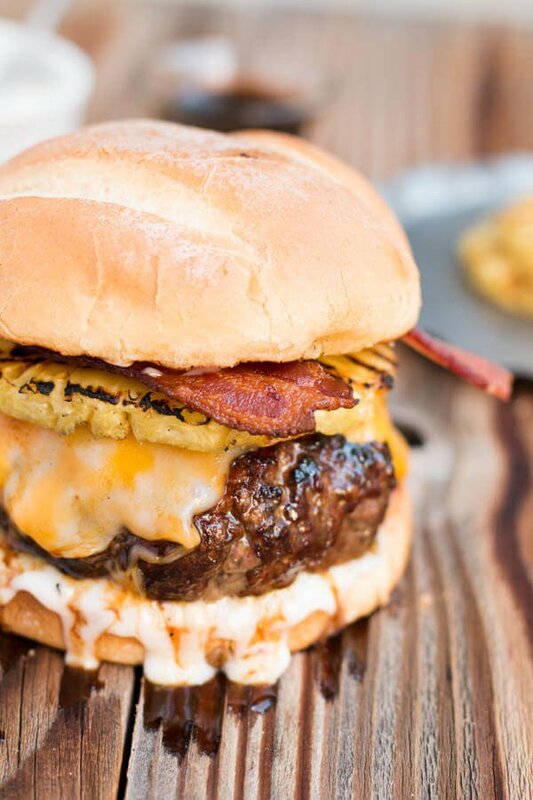 this teriyaki pina colada burger is thanks to our 2 secrets for the best hamburger and I can’t stop making it.